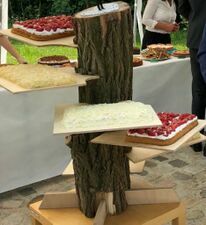 I wanted to make a one-of-a-kind weddding cake stand and took inspiration from the "Lumberjack Championships", where one discipline consists of chopping a wedge out of a tree trunk, jamming a spring board in there, jumping up on the board and cutting the next wedge until the contestant reaches the top to chop that off. Luckily, I found just the right piece of Robinia on a forest hike and used it for this project after drying it for about half a year. After the tree trunk had dried for about half a year, I cut slots into the bottom with Japanese saws and bevel edge chisels where the feet would go. These were just simple pieces of scrap plywood to increase the footprint and make sure the stand would not tip over. Once the feet were screwed in and adjusted to the size of the table the whole thing would be used on, I started cutting wedges out of the "tree" with the Japanese saws. Unlike after the chopping of the actual Lumberjack Championship, I ended up with a solid piece of wood after each cut that I numbered and used to hold the baltic birch plywood boards in place. An alternate (and perhaps easier) method here could have been the use of a chainsaw for a single straight cut of each board's thickness, but that was not the aesthetic I was aiming for. The plywood boards were also numbered and a screw hole was drilled through each wedge-board pair and into the matching place in the trunk. Although everything had held up well just by wedging thus far (tested up to approx. 7 kg), it would have been so bad if one of the boards would slip with a cake on it that the screws were added to be safe.